Online Music Store Chromecast Ultra HD vs Roku, Have You Chosen Yet? Cable TV has become expensive and inadequate for people and that’s why the option of streaming boxes is on the rise. There are different companies indulging themselves in this business like Amazon, Apple, Google and many others. What these companies are aiming to achieve is a media streaming box that is inexpensive and can offer as much content as possible in the best way. This is why media streaming boxes are developed and upgraded within no time. Development has come from these devices offering the standard 1080p resolution content to the 4K UHD content. Chromecast Ultra HD from Google and Roku are two of the popular media streaming devices. While they might offer similar services, they have different features and specifications which we will look at in this article. Someone said the era of the streaming boxes is coming to an end while the era of the streaming dongle. Well, the Roku streaming stick is more attractive as it has a long cylindrical design that doesn’t stick out beyond the edge of your screen like an ugly nub. It has a wireless amplifier that can also stick out meaning you might need some tapes to keep it in order. The better part of this design is that it can draw power from a USB port meaning there is no need for an obtrusive wall adapter. Chromecast Ultra HD ultimately looks better and it is simply a disc that attaches magnetically to the HDMI cable that keeps it out of sight. However, the device isn’t perfect. It will need power from an outlet meaning you have to run a cord to the power source then attach a big oddly shaped adapter and coincidentally, this is the same place you plug in an Ethernet cable making it feel rigged. Any streaming gadget is only as good as its ability to help you connect to your content. This might sound a bit technical but what it means is the easier it is to navigate through an interface, the better you connect to your content. The way you organize apps and navigate menus can make such a big difference. Roku has the best and most straightforward interface as compared to Chromecast Ultra HD which doesn’t even have an interface. Roku has a home screen where all your apps are and you can organize them in any way you want. This is the most natural interface and it lets you access what you want with ease. it doesn’t track your most recently used apps and you cant make folders as well but at the same time, you don’t have to scroll for long before you find the app you need. With Chromecast Ultra HD, simplicity is key. It doesn’t have an interface but you install an app on your phone, tablet or computer and stream the content from your phone to the TV. The Cast button is mainly used and you can also use the Google Home app to search for content or manipulate the settings. This is the single most important part of a streaming device. How well does the streaming device you have connect to what you want to watch? This is sometimes determined by the number of apps on your device. Roku gives you access to over 5000 apps and while you might not browse through them all, this device has a lot to offer. It has some of the major apps like Hulu, Netflix, Amazon Video, YouTube, VUDU, Pandora, Sling TV, CBS All Access, HBO GO, Spotify and many others. It is hard to estimate the number of apps that work with Chromecast Ultra since it’s release. However, we can say that it doesn’t support Amazon Video even though there is an android app for that. The remote control helps you navigate through the interface to open the app you want. 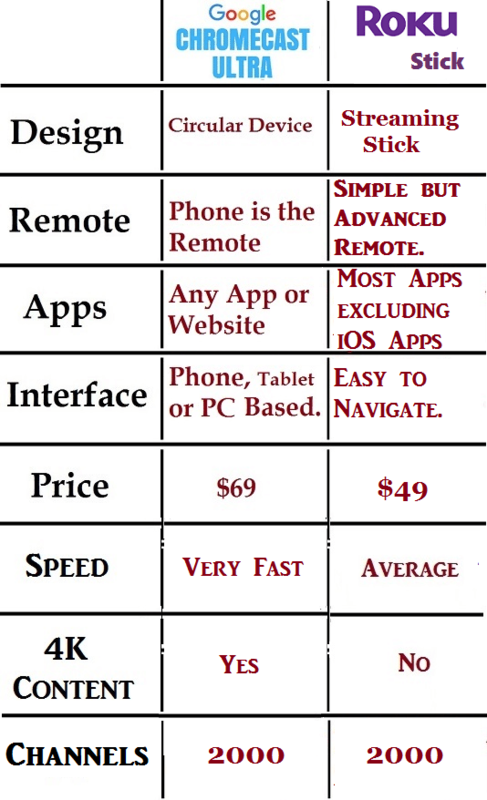 Roku has a standard remote control with different buttons some of them giving you direct access to the major streaming services like Netflix. This makes it easier when searching for content since you don’t have to browse through all of them to get what you want. Chromecast Ultra, on the other hand, doesn’t have a user interface let alone a standard remote control. The only remote control you have is the mobile phone, tablet or computer where you have installed the Cast app. This is best suited when playing games since you will be doing so at the comfort of your touch smartphone making it easier. Both of these devices are great and while Roku doesn’t provide its own music or streaming services, it gives you access to many of these. Chromecast Ultra has it’s own streaming services and it acts as a bridge between your mobile phone or laptop and the TV.